These two 17 year old guys attempted to use a rotary phone… | The Fringe | Conspiracy, News, Politics, and Fun Forum! These two 17 year old guys attempted to use a rotary phone… | The Fringe | Conspiracy, News, Politics, and Fun Forum! These two 17 year old guys attempted to use a rotary phone… The-Fringe | Your #1 Source For Conspiracy, News, Politics, and Fun! Our phone prefix was "Melrose" our phone number was ME6-2851. Melrose was the telephone exchange for our area. When you dialed a number you heard clicks, I believe it was the mechanical relays setting for the number. @phxsparks please correct me if I am wrong on the relay business. Aquarius, Citizen37082, Karu, phxsparks, TheOrderOfChaos, Verity, Wingsprint likes this! Interesting! Thanks for sharing that! and not the entire city. Aquarius, Citizen37082, Karu, TheOrderOfChaos, Wingsprint, WNC likes this! These two are just dumb. I have a rotary phone I used in a set display, my teenage nephew figured it out in seconds. They know how to use record players too. Aquarius, Citizen37082, TheOrderOfChaos, Wingsprint, WNC likes this! OMG!! This funny as all get out! I should show them my 1910 Kellogg wall mount crank phone. That would be a laugh a minute! There was an article in the SF paper about high paid social media workers buying expensive analog watches. Rollex etc at $10,000+ Some reporter started spotting them on the street and, while being filmed, they were asked for the time. They ALL whipped out their smart phones to give the time to the reporter. NONE OF THEM could tell the time on their expensive analog watches. Millennials..
Citizen37082, MaximalGravity, Moon Rocks, TheOrderOfChaos, Wingsprint likes this! (02-10-2019, 10:52 PM)phxsparks Wrote: OMG!! This funny as all get out! Maybe..i haven't looked. It was a news story I read, about the local TV news piece. It's several months old now. I'll have a look and post if I find it. It began as, a story on the very highly paid kids buying large (in size) expensive watches from a jewelry dealer who relocated into a new store. I looked in all the usual places and found nothing. I did find a huge number of sites hawking expensive watches to Millennials. They're being openly sold as fashion items and not time pieces. Citizen37082, Moon Rocks, TheOrderOfChaos, Winter Steelheader likes this! (02-11-2019, 09:26 AM)WNC Wrote: Our phone prefix was "Melrose" our phone number was ME6-2851. Melrose was the telephone exchange for our area. When you dialed a number you heard clicks, I believe it was the mechanical relays setting for the number. @phxsparks please correct me if I am wrong on the relay business. Aquarius, TheOrderOfChaos, Verity, Wingsprint, WNC likes this! Just the first two letters of the word. We started out with just three numbers. "429". It was that way for several years, then went to five numbers, then they added on "Fairfax", but we just used the FA then the five numbers. phxsparks, TheOrderOfChaos, Verity, Wingsprint, WNC likes this! "@phxsparks please correct me if I am wrong on the relay business". Good thread and post. Early dial telephone systems were interesting. As a small child I grew up in rural America. We had a phone with no dial. It was a candle stick phone. You picked up the ear piece and tapped the lever twice. The operator would come on the line. "Number Please"? We could just say we wanted Mr. Lemmon who was the town barber and she would connect. We could say grocery store and she would connect. With a patch cord at the switchboard. 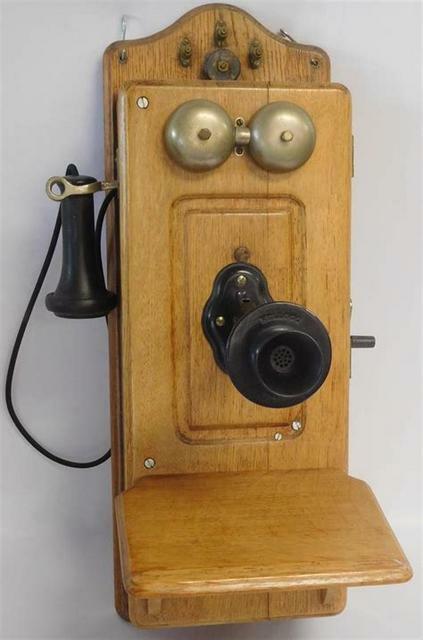 My grand parents had a crank type Kellogg telephone mounted on the wall in a Oak cabinet. When you wanted the operator, you pick up the ear piece and stood next to the microphone and cranked the phone the operator would come on the line. They had batteries in a galvanized steel bucket on the floor, that powered the phone. The phone company would come change the batteries when the voltage got too low. I remember being 5 years old visiting Grammy and she called my Mom so we could talk on this crank phone. They look like the photo below. Where @Aquarius mentioned the relays caught my attention. This is a fascinating story. I am lazy tonight so here are some snippets from wiki for more information. Strowger, an undertaker, was motivated to invent an automatic telephone exchange after having difficulties with the local telephone operators, one of whom was the wife of a competitor. He was said to be convinced that she, as one of the manual telephone exchange operators, was sending calls "to the undertaker" to her husband. He conceived his invention in 1888, and was awarded a patent for an automatic telephone exchange in 1891. The initial model was made from a round collar box and some straight pins. While Almon Strowger devised the initial concept, he was not alone in his endeavors and sought the assistance of his brother Arnold, nephew William, and others with a knowledge of electricity and financing to realize the concept. The Strowger Automatic Telephone Exchange Company was founded in 1891. The Strowger Automatic Telephone Exchange Company became the Automatic Electric Company, which Strowger was involved in founding, although Strowger himself seems not to have been involved in further developments. The Strowger patents were exclusively licensed to the Automatic Electric Company. Strowger sold his patents in 1896 for US$1,800 and sold his share in Automatic Electric in 1898 for US$10,000. His patents subsequently sold for US$2.5 million in 1916. Company engineers continued development of the Strowger designs and submitted several patents in the names of its employees. The Strowger system was widely used until the development of the more reliable crossbar switch, an electromechanical switch with a matrix of vertical and horizontal bars and simpler motions. Aquarius, Moon Rocks, TheOrderOfChaos, Verity, Wingsprint, WNC likes this! (02-11-2019, 11:13 AM)Verity Wrote: Interesting! Thanks for sharing that! Thank you for that info, @phxsparks ... Fascinating information !! phxsparks, TheOrderOfChaos, Wingsprint likes this!